Digestive problems can occur during many stages of a woman's life, including during menopause. A wide spectrum of digestive conditions are classified as “digestive problems”, but some advice can work to treat some of these issues. There are things that you can do in order to remedy digestive problems and stop conditions like bloating that can be uncomfortable and distracting. Probiotics are live organisms that are found naturally in the digestive tract. Also known as “friendly bacteria”, probiotics can improve digestive health and protect you from a range of conditions, including bloating, diarrhea, and constipation. Probiotics are most famously found in many yogurts, but they can also be consumed in the form of cottage cheese, kefir, sauerkraut, miso, kimchi, and wheat grass. Many hot teas can be excellent digestion aids that act to calm the stomach. 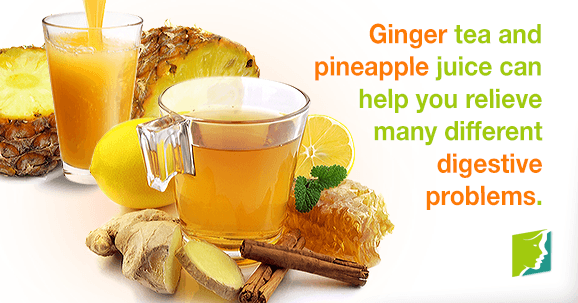 However, ginger is one of the very best, especially for reducing bloating and trapped gas. Another benefit of selecting ginger is the ease of making it. Simply boil fresh ginger root inside a pot for a few minutes and serve. Grating ginger onto meals can also help to remedy digestive problems. Aloe vera juice contains a host of different vitamins, minerals, and other nutrients that can help towards remedying digestive problems. Regularly drinking a glass of aloe vera juice can help keep you protected from gastrointestinal problems. However, aloe vera latex should not be used for an extended period of time. Exercise can often feel like the last thing you want to do when you are suffering from digestive problems. However, it can also be one of the most effective remedies for it, because it can help relieve stress, which has a major impact on your digestive system. Body movement in itself can also help to regulate digestion and promote peristalsis, or the proper passage of food through bowels. Pineapples contain a large amount of bromelain, an enzyme that helps to break down and digest the proteins from food, aiding one of the most significant parts of digestion. Pineapple is an effective remedy for digestive problems, whether it is eaten whole and raw, cooked as part of a meal, or drank as pineapple juice. Digestive problems can frustrating, but the natural remedies listed above can go a long way in providing relief from a range of different digestive problems. However, if you have any further worries or concerns, the best thing to do is to seek the opinion of your doctor. For further information on how to deal with these digestive issues, follow the link below. Foster, M. , Hunter, D. & Samman, S. (2011). Herbal Medicine: Biomolecular and Clinical Aspects. 2nd edition. Chapter 3: Evaluation of the Nutritional and Metabolic Effects of Aloe vera. Boca Raton: CRC Press.